Summary: The Press Conference game involves one player guessing which famous person they have been assigned to be. One guest is sent from the room. Those who are left decide who the absent guest will be when he/she returns. This needs to be a person famous enough that all the guests know a little something about. It could even be a mutual friend of everyone at the party. 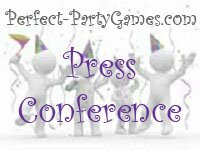 After the name is chosen, invite the player back into the room and hold a "press conference." The other guests will ask him or her questions that would be appropriate to the person he or she is supposed to be. Guests should try to be creative and pointed in their questions to help the player figure out their character. You can either set a time limit for each player to be interviewed or just allow the game to play out naturally.